Fancy Embroidered Ladies Salwar Suit Offered Comprise Exclusive Collection Of Highly Fashionable Dresses Which Can Be Made Available In Rich Color Shades And Decorative Patterns That Enhance Overall Finish Value Of These Apparels. Further, These Suits Come With Latest Fashion Support And Match Up With Tastes Of Fashion Conscious Ladies. Some Of Its Features Include Suitable As Party Wear; Beautiful, Exciting And Attractive Finish Designs; Smooth And Shiny Finish. Embroidered Georgette Salwar Kameez Offered Are Made Available By Us In Exclusive Work Finish As Well As Other Fabric Design Options Which Makes These Designer Suits All The More Exciting Wear Choice. Further, These Exciting Apparel Choices Are Suitable To Be Worn During All Important Occasions. Some Of Its Features Include Featuring Beautiful Work Finish; Meeting Demands Of Exclusive Fresh And Trendy Apparels; Exciting Color Choices; Meets Demands Of Fashion Conscious Customers; Attractive Color Shade Choices; Perfect For Party Wear And Other Formal Occasions. Our Fancy Designer Salwar Suits Gives Perfect Look For Any Occasions.these Are Very Stylish & Magnificent In Look And Also Easily Available In Market. The Eye Catching Combination Of Red Embroidered Kurta With White Patiala Style Salwar Gives Perfect Look For Any Occasion.this Latest Wedding Designer Suits Look Classy In Any Occasion. 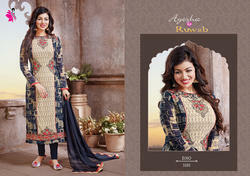 Fashion Ladies Suits offered come in glorious designer patterns and can be made available in different color prints. Having in them a touch of class and exclusiveness, these ladies suits create for unique styles as well as highly presentable dressed looks. Some of its features include vibrant finish which make these highly desired by ladies; provides for stunning presentation looks; adds a touch of grace to personality of wearers; smooth designed finish; available in different sizes from small, medium to large. 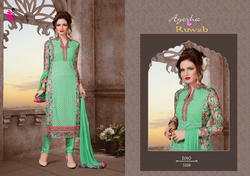 Designer Georgette Salwar Kameez offered are designed to perfectly match up to exclusive dressed looks of the ladies. These are presented in rich bright color choices as well as exclusive printed design shades which make these provide for different, exclusive looks. Some of its features include add a touch of elegance to the dressing sense of wearers; designer appearance; eye-catchy designs and elegant patterns; superior textured finish and elegant designs.